Keywords: Ultrasound; three-dimensional; hysteroscopy; uterus; bleeding. Keywords: Cobb-Douglas, Stochastic frontier, Technical efficiency. 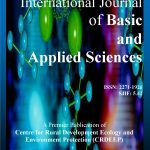 Flood Inundation Simulation using HEC-RAS Hydrologic Model: A Case Study of Oyun River, Nigeria. Keywords: Flood Inundation, HEC-RAS model, Hydrologic modeling, Inundation Mapping, Simulation.